Hedges are shrubs or trees used to landscape a yard, creating a wall-like effect. Hedges are used for both decoration and privacy as well as marking boundaries. Different types of hedges have their own nuisances, but all take a great deal of work to maintain. Flowering hedges are shrubs or trees that produce flowers as part of their annual growth process. Hedges that flower are desirable to those who enjoy buzzing bees, birds and a good amount of fragrance. These hedges are slow to grow, requiring maybe one pruning session per year. Mountain laurels, azaleas and privets are examples of flowering hedges. Some azaleas and privets are evergreen varieties, making them suitable for a variety of climates. Not all flowering shrubs are evergreens, however, and will not survive in harsh climate zones. Nurseries will have information regarding the suitability of their hedges for your region. Deciduous hedges, plants that lose their leaves annually, grow faster than most varieties during the summer and may require heavy pruning throughout the year. Fast growers, such as privet, may need several trims throughout the year to maintain shape and prevent unsightly branch growth. Other deciduous shrubs will need two trims per year at least, once when the hedge is at its desired height and another when the hedge needs reshaping. Deciduous hedges have more varieties with flowers than evergreens. Hibiscus, forsythia and lilac bushes belong to the deciduous family. Deciduous shrubs are attractive when in flower but are bare throughout the winter, making them less than ideal for privacy. Evergreen hedges do not lose their leaves at the end of the year, making them a good choice for hedges close to a home for privacy. Evergreens come in two varieties, both narrow leaf and broad leaf. Narrow-leaf plants may need heavy trimming throughout the year and can be cut into an aesthetically appealing shape. Broad-leaf plants require less trimming, just a simple cutting back into shape and a trimming of the buds for next year's production. 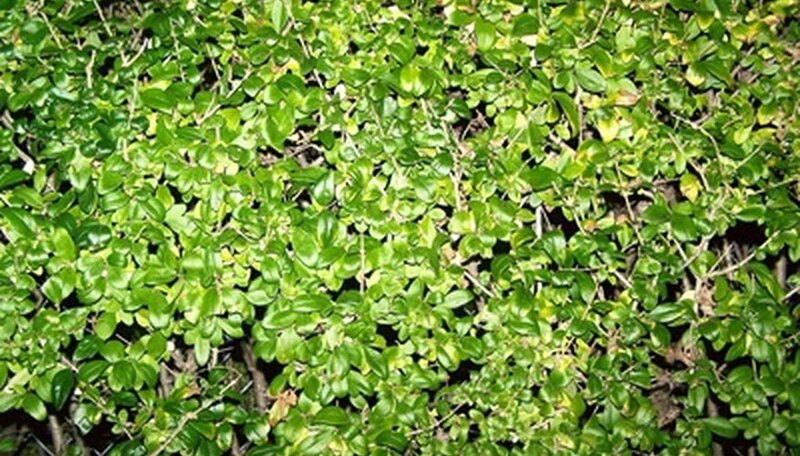 Japanese holly, a box-shaped shrub, English holly and boxwoods are the most common examples of evergreen shrubs. What Shrubs Are Good for Privacy?